The Hamech area is located in the west of Kuh-e-Shah volcano-plutonic complex, close to the boundary between the Lut Block and Sistan Suture Zone (SSZ), and is composed of monzonite to diorite porphyries and rare gabbro that intruded into older volcanic rocks. U-Pb zircon dating indicates an age of 36.9 ± 1 Ma for gabbro (Late Eocene, Priabonian) and 38.6 ± 0.5 Ma for dacite (Late Eocene, Bartonian). Geochemically, the studied intrusions are dominantly I-type, high-K calc-alkaline, and metaluminous features. Primitive mantle-normalized trace-element spider diagrams of these rocks present enrichment in ion lithophile elements such as Cs, Rb, Ba, K, and Sr and depletion in high field strength elements such as Nb, Ti, Zr, and heavy rare earth elements. Besides, chondritenormalized rare earth elements plots of the rocks show enrichment in light rare earth elements (6.85 < LaN/YbN < 9.72) and a lack or weak negative Eu anomaly (Eu/Eu* = 0.81-1.02). The initial 87Sr/86Sr and 143Nd/144Nd ratios for the rocks from 0.704541 to 0.704880 and from 0.512633 to 0.512691, respectively, when recalculated to an age of 39 Ma. The εNd(i) values vary from +0.87 to +1.99, which fits into a suprasubduction mantle wedge source for the parental melts. All data suggest that the Hamech intrusions developed in a low maturity continental margin arc setting related to the convergence of the Afghan and Lut Blocks and subduction of Sistan oceanic crust during the Eocene. Abdi M, Karimpour MH (2013). Petrochemical characteristics and timing of Middle Eocene granitic magmatism in Kooh-Shah, Lute Block, Eastern Iran. Acta Geol Sin 84: 1032-1044. Aghanabati A (1998). Major sedimentary and structural units of Iran (map). J Geosci 7: 29-30. Aghanabati A (2005). Geology of Iran: Geological Survey of Iran, Tehran, Iran (in Persian). Alavi M (1991). Sedimentary and structural characteristics of the Paleo-Tethys remnants in northeastern Iran. Geol Soc Am Bull 103: 983-992. Andrade FRD, Möller P, Höhndorf A (1999). The effect of hydrothermal alteration on the Sr and Nd isotopic signatures of the Barra do Itapirapuã carbonatite, southern Brazil. The J Geol 107: 177-191. Arjmandzadeh R (2011). Mineralization, geochemistry, geochronology, and determination of tectonomagmatic setting of intrusive rocks in Dehsalm and Chahshaljami prospect areas, Lut block, east of Iran. PhD, Ferdowsi University of Mashhad, Mashhad, Iran. Arjmandzadeh R, Karimpour MH, Mazaheri SA, Santos JF, Medina JM, Homam SM (2011). Sr–Nd isotope geochemistry and petrogenesis of the Chah-Shaljami granitoids (Lut Block, eastern Iran). J Asian Earth Sci 41: 283-296. Arjmandzadeh R, Santos JF (2014). Sr–Nd isotope geochemistry and tectonomagmatic setting of the Dehsalm Cu–Mo porphyry mineralizing intrusives from Lut Block, eastern Iran. Int J Earth Sci 103: 123-140. Asiabanha A, Bardintzeff JM, Kananian A, Rahimi G (2012). Post-Eocene volcanics of the Abazar district, Qazvin, Iran: Mineralogical and geochemical evidence for a complex magmatic evolution. J Asian Earth Sci 45: 79-94. Babazadeh SA, De Wever P (2004). Radiolarian Cretaceous age of Soulabest radiolarites in ophiolite suite of eastern Iran. B Soc géol Fr 175: 121-129. Berberian M (1981). Towards a paleogeography and tectonic evaluation of Iran. Can J Earth Sci 18: 210-265. Berberian M, Jackson JA, Qorashi M, Khatib MM, Priestley K, Talebien M, Ghafuri-Ashtiani M, (1999). The 1997 May 10 Zirkuh (Qaenat) earthquake (M.W 7.2): aulting along the Sistan suture zone of eastern Iran. Geophys J Int 136: 671-694. Beydokhti RM, Karimpour MH, Mazaheri SA, Santos JF, Klötzli U (2015). U–Pb zircon geochronology, Sr–Nd geochemistry, petrogenesis and tectonic setting of Mahoor granitoid rocks (Lut Block, Eastern Iran). J Asian Earth Sci 111: 192-205. Blein O, Lapierre H, Schweickert RA (2001). A Permian island- arc with a continental basement: the Black Dyke Formation Nevada, North American Cordillera. Chem Geol 175: 543-566. Boynton WV (1984). Cosmochemistry of the rare earth elements: meteorite studies. In: Henderson P, editor. Rare Earth Element Geochemistry. Amsterdam, the Netherlands: Elsevier, pp. 63- 107. Brown GC, Thorpe RS, Webb PC (1984). The geochemical characteristics of granitoids in contrasting arcs and comments on magma sources. J Geol Soc 141: 413-426. Camp V, Griffis R (1982). Character, genesis and tectonic setting of igneous rocks in the Sistan suture zone, eastern Iran. Lithos 15: 221-239. Chang Z, Vervoort JD, McClelland WC, Knaak C (2006). U-Pb dating of zircon by LA-ICP-MS. Geochem Geophy Geosy 7: 1-14. Chappell BJ, White AJR (1974). Two contrasting granite types. Pac Geol 8: 173-174. Condie KC (1989). Geochemical changes in basalts and andesites across the Archean-Proterozoic boundary: identification and significance. Lithos 23: 1-18. Cotton J, Le Dez A, Bau M, Caroff M, Maury RC, Dulski P, Fourcade S, Bohn M, Brousse R (1995). Origin of anomalous rare-earth element and yttrium enrichments in subaerially exposed basalts, evidence from French Polynesia. Chem Geol 119: 115-138. Crawford AJ, Falloon TJ, Green DH (1989). Classification, petrogenesis and tectonic setting of boninites. In: Crawford AJ, editor. Boninites and Related Rocks, London, UK: Unwin Hyman, pp. 1-49. Çoban H (2007). Basalt magma genesis and fractionation in collision- and extension-related provinces: a comparison between eastern, central western Anatolia. Earth Sci Rev 80: 219-238. Defant MJ, Drummond MS (1990). Derivation of some modern arc magmas by melting of young subduction lithosphere. Nature 347: 662-665. Depaolo DJ (1988). Neodymium Isotope Geochemistry. Berlin, Germany: Springer. Drake MJ, Weill DF (1975). Partition of Sr, Ba, Ca, Y, Eu 2+ , Eu 3+ and other REE between plagioclase feldspar and magmatic liquid: an experimental study. Geochim Cosmochim Act 39: 689-712. Eftekharnejad J (1980). separating different parts of Iran in vies of constructional position related too sedimentary basins, Petrol Association Publication 82. Fan WM, Guo F, Wang YJ, Zhang M (2004). Late Mesozoic volcanism in the northern Huaiyang tectono-magmatic belt, central China: partial melts from a lithospheric mantle with subducted continental crust relicts beneath the Dabie orogen? Chem Geol 209: 27-48. Frey FA, Chappell BW, Roy SD (1978). Fractionation of rare-earth elements in the Tuolumne Intrusive Series, Sierra Nevada batholith, California. Geology 6: 239-242. Ghorbani M (2013). The Economic Geology of Iran: Mineral Deposits and Natural Resources. 1st ed. Dordrecht, the Netherlands: Springer Science and Business Media. Gill JB (1981). Orogenic Andesites and Plate Tectonics, Mineral and Rocks 6. Berlin, Germany: Springer-Verlag. Halliday AN, Lee DC, Tommasini S, Davies GR, Paslick CR, Fitton JG, James DE (1995). Incompatible trace elements in OIB and MORB and source enrichment in the sub-oceanic mantle. Earth Planet Sc Lett 133: 379-395. Hanson GN (1980). Rare earth elements in petrogenetic studies of igneous systems. Annu Rev Earth Pl Sc 8: 371-406. Helvacı C, Ersoy EY, Sözbilir H, Erkül F, Sümer Ö, Uzel B (2009). Geochemistry and 40 Ar/ 39 Ar geochronology of Miocene volcanic rocks from the Karaburun Peninsula: implications for amphibolebearing lithospheric mantle source, Western Anatolia. J Volcanol Geoth Res 185: 181-202. Hofmann AM (1997). Mantle geochemistry: the message from oceanic volcanism. Nature 385: 219-229. Hosseinkhani A, Karimpour MH, Shafaroudi AM, Santos JF (2017). U-Pb geochronology and petrogenesis of intrusive rocks: Constraints on the mode of genesis and timing of Cu mineralization in SWSK area, Lut Block. J Geochem Explor 177: 11-27. Jamali H (2017). The behavior of rare-earth elements, zirconium and hafnium during magma evolution and their application in determining mineralized magmatic suites in subduction zones: constraints from the Cenozoic belts of Iran. Ore Geol Rev 81: 270-279. Jung D, Keller J, Khorasani R, Marcks C, Baumann A, Horn P (1983). Petrology of the Tertiary magmatic activity the northern Lut area, East of Iran. Ministry of Mines and Metals, GSI, Geodynamic Project (geotraverse) in Iran, No. 51, pp. 285-336. Jung S (1999). The role of crustal contamination during the evolution of continental rift-related basalts: a case study from the Vogelsberg area (central Germany). Geolines 9: 48-58. Karimpour MH, Malekzadeh Shafaroudi A, Mazaheri SA, Haidarian Shahri MH (2007). Magmatism and different types of mineralization in Lut Block. In: 15th Symposium of Iranian Society of Crystallography and Mineralogy, Ferdowsi University of Mashhad, Iran, pp. 598-604. Karimpour MH, Stem CR, Farmer L, Saadat S, Malekezadeh A (2011). Review of age, Rb-Sr geochemistry and petrogenesis of Jurassic to Quaternary igneous rocks in Lut Block, Eastern Iran. Geopersia 1: 19-36. Kay SM, Mpodozis C (2001). Central Andean ore deposits linked to evolving shallow subduction system and thickening crust. GSA today 11: 4-9. Ludwig KR (2007). Isoplot version 3.7, User’s Manual. Berkeley Geochronology Center, Special Publication 4. Mahdavi A, Karimpour MH, Mao J, Shahri MRH, Shafaroudi AM, Li H (2016). Zircon U–Pb geochronology, Hf isotopes and geochemistry of intrusive rocks in the Gazu copper deposit, Iran: petrogenesis and geological implications. Ore Geol Rev 72: 818-837. Malekzadeh Shafaroudi A (2009). Geology, mineralization, alteration, geochemistry, Microthermometry, radioisotope and Petrogenesis of intrusive rocks copper-gold porphyry Maherabad and Khopik. PhD, Ferdowsi University of Mashhad, Mashhad, Iran. Malekzadeh Shafaroudi A, Karimpour MH, Stern CR (2015). The Khopik porphyry copper prospect, Lut Block, Eastern Iran: geology, alteration and mineralization, fluid inclusion, and oxygen isotope studies. Ore Geol Rev 65: 522–544. Martin H (1987). Petrogenesis of Archaean trondhjemites, tonalites, and granodiorites from eastern Finland: major and trace element geochemistry. J Petrol 28: 921-953. McCulloch MT, Bennett VC (1994). Progressive growth of the Earth’s continental crust and depleted mantle: geochemical constraints. Geochim Cosmochim Act 58: 4717-4738. Menzies MA, Long A, Ingeram G, Talnfi M, Janfcky D (1993). MORB preidotite–seawater interaction: experimental constrains on the behavior of trace elements. 87 Sr/ 86 Sr and 143 Nd/ 144 Nd ratios. In: Princhard HM, Alabaster T, Harris NBW, Neary CR, editors. Magmatic Process and Plate Tectonics, Geological Society, London, Special Publications, vol. 76, pp. 309-322. Middlemost EAK (1985). Magmas and Magmatic Rocks. London, UK: Longman. Nabatian G, Ghaderi M, Neubauer F, Honarmand M, Liu X, Dong Y, Jiang S, Quadt A, Bernroide M (2014). Petrogenesis of Tarom high-potassic granitoids in the Alborz-Azarbaijan belt, Iran: geochemical, U–Pb zircon and Sr–Nd–Pb isotopic constraints. Lithos 184: 324-345. Nicholson KN, Black PM, Hoskin PWO, Smith IEM (2004). Silicic volcanism and back-arc extension related to migration of the Late Cainozoic Australian- Pacific plate boundary. J Volcanol Geoth Res 131: 295-306. Pearce JA (1983). Role of the sub-continental lithosphere in magma genesis at active continental margins. In: Hawkesworth CJ, Norry MJ, editors. Continental Basalts and Mantle Xenoliths. Nantwich, UK: Shiva Publisher, pp. 230-249. Pearce JA, Harris NB, Tindle AG (1984). Trace element discrimination diagrams for the tectonic interpretation of granitic rocks. J petrol 25: 956-983. Peccerillo A, Taylor SR (1976). Geochemistry of Eocene calc-alkaline volcanic rocks from the Kastamonu area (northern Turkey). Contrib Mineral Petr 58: 63-81. Richards JP, Spell T, Rameh E, Razique A, Fletcher T (2012). High Sr/Y magmas reflect arc maturity, high magmatic water content, and porphyry Cu±Mo±Au potential: examples from the Tethyan arcs of central and eastern Iran and western Pakistan. Econ Geol 107: 295-332. Rollinson HR (1993). Using Geochemical Data: Evaluation, Presentation, Interpretation. Essex, UK: Longman Science and Technical. Rollinson H (2014). Plagiogranites from the mantle section of the Oman Ophiolite: models for early crustal evolution. Geological Society, London, Special Publications 392: 247-261. Rudnick RL (1995). Making continental crust. Nature 378: 571-578. Saadat S, Stern CR (2016). Distribution and geochemical variations among paleogene volcanic rocks from the north-central Lut block, eastern Iran. Iran J Earth Sci 8: 1-24. Saccani E, Delavari M, Beccaluva L, Amini SA (2010). Petrological and geochemical constraints on the origin of the Nehbandan ophiolitic complex (eastern Iran): implication for the evolution of the Sistan Ocean. Lithos 117: 209-228. Salati E, Karimpour MH, Malekzadeh Shafaroudi A, Heydarian Shahri MR, Farmer L, Stern Ch (2012). Zircon U– Pb geochronology, Sr–Nd isotope geochemistry, and petrogenetic study of Kaybar kuh oxidan granitoids (Sout- West of Khaf ). J Econ Geol 4: 285-301 (in Persian). Samani B, Ashtari S (1992). Geological evolution of Sistan and Baluchestan area. Geological Survey of Iran, J earth sci 4: 72-85 (in Persian with English abstract). Samiee S, Karimpour MH, Ghaderi M, Haidarian Shahri MR, Kloetzli O, Santos JF (2016). Petrogenesis of subvolcanic rocks from the Khunik prospecting area, south of Birjand, Iran: Geochemical, Sr–Nd isotopic and U–Pb zircon constraints. J Asian Earth Sci 115: 170-182. Shand SJ (1949). Eruptive Rocks: Their Genesis, Composition, Classification, and Their Relation to Ore-deposits. Thomas Murby. Shaw DM (1970). Trace element fractionation during anataxis. Geochim Cosmochim Act 34: 237-243. Stöcklin J, Eftekhar-Nezhad J, Hushmand-Zadeh A (1965). Geology of the Shotori range (Tabas area, east Iran) (No. 3), Geological Survey of Iran. Stocklin J (1968). Structural history and tectonics of Iran: a review. AAPG Bull 52: 1229-1258. Stocklin J, Nabavi MH (1973). Tectonic map of Iran. Geological Survey of Iran. Sun SS, McDonough WF (1989). Chemical and isotopic systematics of oceanic basalts: implications for mantle composition and processes. Geol Soc Sp 42: 313-345. Tarkian M, Lotfi M, Baumann A (1983). Tectonic, magmatism and the formation of mineral deposits in the central Lut, east Iran. Ministry of mines and metals, GSI, geodynamic project (geotraverse) in Iran, 51: 357-383. Taylor SR, McLennan SM (1985). The Continental Crust: Its Composition and Evolution. Oxford, UK: Blackwell. Temizel I, Arslan M (2009). Mineral chemistry and petrochemistry of post-collisional Tertiary mafic to felsic cogenetic volcanics in the Ulubey (Ordu) area, Eastern Pontides, NE Turkey. Turk J Earth Sci 18: 29-53. Thirlwall MF, Smith TE, Graham AM, Theodorou N, Hollings P, Davidson JP, Arculus RJ (1994). High field strength element anomalies in arc lavas: source or process? J Petrol 35: 819-838. Tirrul R, Bell IR, Griffis RJ, Camp VE (1983). The Sistan suture zone of eastern Iran. Geol Soc Am Bull 94: 134-156. Vervoort JD, Patchett PJ, Blichert-Toft J, Albarede F (1999). Relationship between Lu–Hf and Sm–Nd isotopic systems in the global sedimentary system. Earth Planet Sc Lett 168: 79-99. Wang K, Plank T, Walker JD, Smith EI (2002). A mantle melting profile across the Basin and Range, SW USA. J Geophys Res 107: 5-21. Whitney DL, Evans BW (2010). Abbreviations for names of rock- forming minerals. Am mineral 95: 185-187. Wilson M, (1989). Igneous Petrogenesis. London, UK: Chapman and Hall. Winter J (2001). Introduction to Igneous and Metamorphic Petrology. Upper Saddle River, NJ, USA: Prentice Hall. Zarrinkoub MH, Pang KN, Chung SL, Khatib MM, Mohammadi SS, Chiu HY, Lee HY (2012). Zircon U-Pb age and geochemical constraints on the origin of the Birjand ophiolite, Sistan suture zone, eastern Iran. Lithos 154: 392-405. Zirjanizadeh S, Karimpour MH, Nasrabadi KE, Santos JF (2016). Petrography, Geochemistry and Petrogenesis of Volcanic Rocks, NW Ghonabad, Iran. J Econ Geol 8: 265-282. Zulkarnain I (2009). Geochemical signature of Mesozoic volcanic and granitic rocks in Madina regency area, North Sumatra, Indonesia and its tectonic implication. Indonesian J Geosci 4: 117-131. ISNAD ETEMADI, Abbas , KARIMPOUR, Mohammad Hassan , MALEKZADEH SHAFAROUDI, Azadeh , SANTOS, José Francisco , MATHUR, Ryan , RIBEIRO, Sara . "U-Pb zircon geochronology, geochemistry, and petrogenesis of the Hamech intrusions in the Kuh-e-Shah volcano-plutonic complex, Eastern Iran". 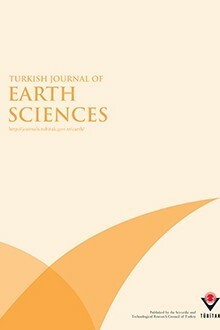 Turkish Journal of Earth Sciences 28 / 1 (January 2019): 38-59.